From the road and town it would be easy to miss the villa as it sits alone against the mountain with only a single access gate to hint at what is behind. It is located off the shore road which is not open to through traffic and is therefore peaceful and quiet. Its position is both private and not overlooked with its terraces that enjoy sunshine and stunning, uninterrupted views across Lake Lugano. The villa is ideal for those wishing to enjoy a relaxing waterside holiday with as much privacy as you could want but also close to the hustle and bustle of towns and the city to satisfy those days when you want to venture out. 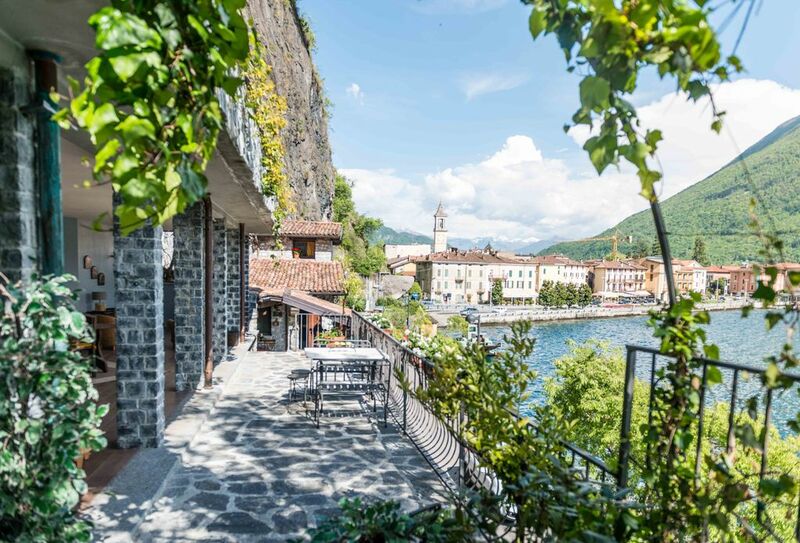 This property is also perfect for a two-center holiday when combined with a stay in Lake Como - experience the two very different aspects and lifestyles of the lakes. Out and about: Being just meters from the gorgeous lakeside town of Porlezza you have no need for a car for every day living. There is a nearby marina from which to catch the ferry to the city of Lugano in nearby Switzerland and bus stops to Lugano and Menaggio. From Menaggio you can catch a ferry to Bellagio, Varenna, Tremezzo and of course Como either with a car or on foot. Porlezza has many lovely bars, restaurants and a good selection of shops or you can simply sit by the lake and marina and soak up the ambiance, or take a walk through the maze of old Italian streets that twist and turn. Lugano is located at one end of Lake Lugano, just across the border into Switzerland and no more than an hour from Lake Como by car or bus. The town centre is a sympathetic pastiche of new and old and is beautifully kept with many old cobbled streets playing host to some of the very finest shops in the region. The property: The villetta is accessed from the shore road through a private wrought iron gate that provides total privacy from the odd passer by. Through the gate you go up a few stone steps onto the panoramic terrace that sits a few metres above the lake. On the terrace there is more than ample space with table and chairs, sun beds and a hammock for those lazy sunny days and al fresco dining. This inside/outside terrace truly is a haven of intimacy with incredible views of the surrounding shore and lake. From here you can access another terrace housing the outdoor kitchen and BBQ which is directly in front of the door to the apartment itself. The cool stone walls, lapping water and shade will make you feel like you are a million miles from the city. The property (continued): Into the apartment itself though the thick wooden doors you enter the open living and dining area which is furnished with traditional Italian furniture and modern appliances that ensure you will not want for anything. The entire apartment is dominated by the hewn rock face of the mountain which ensures the villetta stays cool in summer and warm in the winter. There are panoramic lake views from the windows and another small private terrace located just off the kitchen area. The floors are in solid stone and the decor is simple yet contemporary, combining old and new with arm chairs set in front of the working log fire. There is also a dining table and chairs for those evenings when you prefer to dine in. Unique, full of character and charm, and NOT cookie cutter! My husband and I enjoyed our stay in this beautiful villa, with all its character and charm, and would choose this property again when visiting this area. Davide and Rosalina were very responsive, and the location is excellent, with an easy 2-minute walk to restaurants and plenty of parking right outside your door. The views of the lake and town are exceptional, and the various outside areas make this place phenomenal. The pictures and description are accurate. The villa is very old and historical, so you need to appreciate its uniqueness and all the character that comes with it. It has been lovingly restored, and a second, modern bathroom has been added that is situated next to the large patio, which is not attached to the main house. However, the bedroom does have a small bathroom for your convenience. The bedroom is very small and cozy and does not have drawers or nightstands, but there is a standing rack to hang clothes. We used the windowsill for socks and underwear. The proximity to Lake Como or the town of Lugano in Switzerland is an easy 15- 20-minute drive. However, I recommend taking the ferry to the town of Lugano to enjoy the views from the water and eliminate the stress of parking. Porlezza has plenty of areas to hike and explore, and I would not hesitate to stay here again! I loved every moment. The house was great. It had everything that we needed in order to be comfortable. The only problem we had was getting the correct address. Our host was kind enough to send her father down to take us to the correct address of the house which was about a block away. Polezza is a perfect little place to get away from the hustle and bustle of Lugano. But but you can also visit Lugano which is only about a 20 minute drive from Polezza. The town of Polezza is with in walking distance which made it easy to get around. I would certainly recommend this place to my family and friends. After spending two days in wonderful Verona at the start of our honeymoon we picked up our hire car and drove the scenic route to Porlezza and this fabulous property. We were met by Danielle who showed us round the property and made us feel very welcome. As a previous reviewer has already said, the photos do not do this property justice. The inside of the house is quite small but very cosy. It's the outside areas that bring this place to life. We used the outside cooking area everyday for breakfast and sometimes dinner while overlooking Lake Lugano. From there you go up the stairs to the outside terrace with numerous seating areas, dining table and chairs and a wine fridge! The views are wonderful and we were lucky enough to be here to see the annual firework display that takes place on the lake. We had the best view in Porlezza. The town of Porlezza is a five minute walk away and has everything you need. Pronto Pizza is lovely as is bar Tris. There are supermarkets and a lovely deli for fresh bread every morning. We caught the boat from Porlezza to Lugano in Switzerland which takes around an hour and gives you lovely views of the lake and the surrounding mountains. Lugano itself is very chic. Another worthwhile trip if you have a car is to Menaggio on Lake Como which is about 12kms away. From there get the ferry to Bellagio: supposedly one of the most beautiful towns in Italy. It's a very busy bustling place and great for people watching. Beautiful views and an unforgettable trip! The pictures of this property don't do it justice! We enjoyed our 3 nights at this property and would love to come back! We stayed here with our infant son (4 months old) and our dog. Sitting out on the outdoor space and enjoying the view of the lake was hands down our favorite thing about this property. The only hiccup was that we weren't informed that we wouldn't be able to check-in until later than the scheduled time due to the A/C installation until the day before we checked in. We also drove our large SUV and there was plenty of parking on the road in front of the house. Overall our stay was great and we couldn't recommend this property more! It was very relaxing and close to many activities. This place is enchanting and a little wild. This property is so fun and unique. We spent the majority of our time in the outdoor living space and were delighted with all the character. The views are to die for, but beware of the tiny lizards that enjoy all the hot stone! We felt it was an extremely authentic experience. We had a wonderful 5 day stay - the villa is built out of stone into the cliff face on a quiet road right next to the lake. It was a flexible space and as the weather heated up we were able to use different parts of the terrace with the lake view always dominating. There is a small supermarket a few minutes walk up the main road that has everything you might need, and a lovely bakery nearby. Later in the afternoon after about 4pm the shops open in the small narrow streets of Porlezza with a good butchers, food and gift shops. It is a small quiet area but with a bit of perseverance we found bike hire (Zizzi Autos at Piano after 3pm) and boat hire (Gobbi boats at Cima) and swam in the lake. It was a little tricky without a car but the C12 bus is very cheap, around 4 euros to Lugano, For less than 2 euros you can get the bus to the beautiful wildlife reserve and lake Piano. There were mosquitos in the evening but the main building of the villa has special window and door screens. Highly recommend. A relaxing waterside holiday retreat - perfect for honeymoons. Sleeping up to three people. Living/dining area with working fire, indoor kitchen, one double bedroom with en suite bathroom with shower, three private terraces, outdoor kitchen and BBQ. The gorgeous and romantic villa lies discreetly on the shores of the lovely lakeside town of Porlezza on the north-eastern section of Lake Lugano on the Italian side. Just 15 minutes from the cosmopolitan Swiss city of Lugano and 20 minutes from the bustling town of Menaggio on Lake Como with its easy access to Bellagio, Tremezzo and Como itself. Golf: The Menaggio & Cadenabbia Golf Club, the second oldest Golf Club in Italy represents British tradition at its best. Overlooking Lake Como, it is a course combining old-world values with a heritage of golfing culture. The elevated position of the course provides splendid views in all directions. Ski: Bormio, Madesimo, Livigno, St Moritz are a short drive away. A deposit of 50% is payable once we have confirmed your booking. This can be paid by Visa, MasterCard or bank transfer. The balance is then payable one month before arrival, by Visa, MasterCard or bank transfer. A cash deposit to cover breakages will be collected/returned by the owner on arrival/departure. The amount will be confirmed in your arrival pack.